"An adaptation of that fast-food gravy that we love, making it suitable for Thanksgiving dinners." Place giblets and neck in a saucepan with enough water to cover by 2 inches; bring to a boil, reduce heat to low, and simmer until cooked through, 30 to 45 minutes. Transfer giblets and neck to a cutting board. Finely mince heart, liver, and gizzard meat; reserve 1/3 cup minced meat. Remove meat from neck and finely mince. Mash neck meat in a mortar with a pestle. Heat oil in large saucepan over medium-high heat. Saute green bell pepper in hot oil until fragrant and slightly softened, about 1 minute. Pour water and broth into saucepan. Immediately whisk cornstarch and flour into broth mixture until smooth. 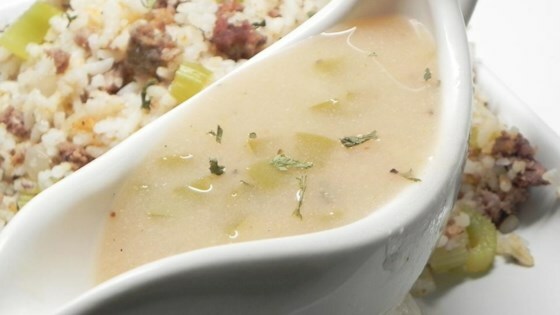 Stir minced meat, mashed neck meat, cubed turkey, milk, vinegar, sugar, salt, black pepper, cayenne pepper, garlic powder, onion powder, and dried parsley flakes into broth mixture; bring to a boil, reduce heat to low, and simmer, whisking occasionally, until gravy is thick, 30 to 35 minutes. You can substitute low-sodium chicken broth for the turkey broth.